We cant see any cracks in the photo above. But seen in lights, the inside of the transparent frame has many cracks. Please check the photos below..
Before a customer asked me to put new prescription lenses into a vintage frame never worn but I found it has some cracks. He bought them at another shop. Most of vintage dealers seem to sell them as is without their realizing the fact. 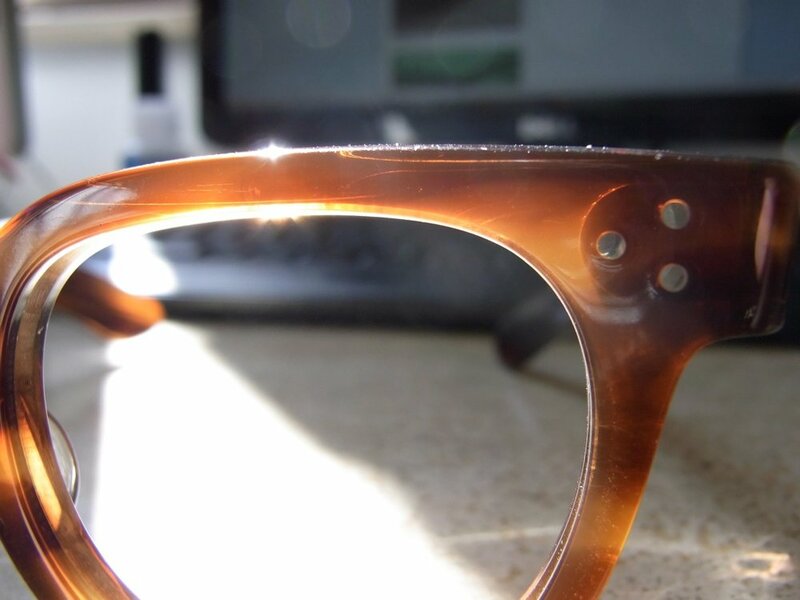 Celluloid frames in Amber color used by Tart Optical often has cracks in their front frame so you should remember it. Most dealers selling vintage frames seem to sell only after buying. At SOLAKZADE, after arrival, we firstly inspect each frame carefully for even a tiny crack. Then restore cordially. While restoring, we buff to make them naturally burnished with a specialized motor device and sometimes with a file and a specialized knife. If necessary, we pull a screw on a hinge and replace it with a new one. And sometimes lenses need to be replaces. After an order, we can make prescription lenses. We can customize nose pads for asian customers. At SOLAKZADE, a person skilled in the art of this restoration consistently does this whole process.